The dominoes have been falling ever since. Buoyed by the success of La Course, ASO will extend the formula to the Vuelta a Espana this year. As the men arrive in Madrid to a crowd warmed up by the pro women, we might still debate whether we should build standalone races or piggy-back the men’s events, but we’re still way in front. Before the Vuelta we’ll see the return of the women’s Tour of New Zealand, a new women’s Strade Bianche (can’t wait) and a new three-day women’s race at the Tour of California. There’s others. 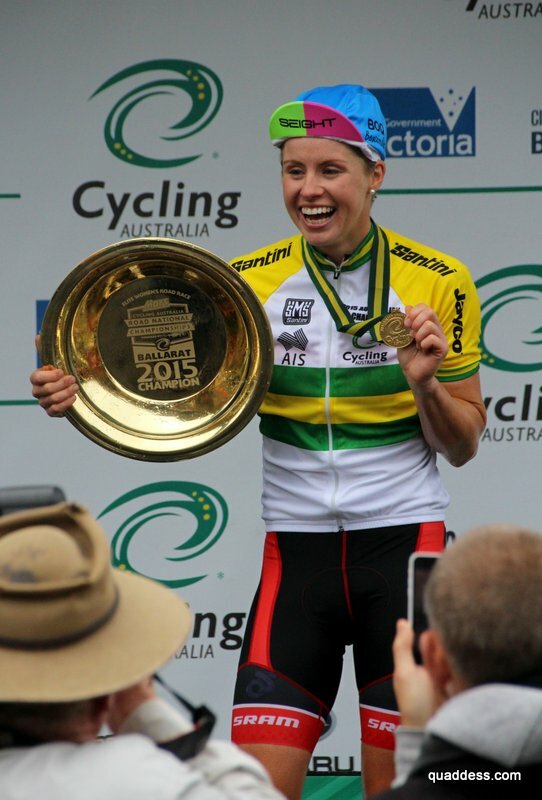 Locally it’s a better story too as Cycling Australia boosted the 2015 National Road Series (NRS) calendar with the Santos Women’s Tour (an extra day of racing on last year) and the Cadel Evans Great Ocean Road Race. Thanks Cadel. And the women have delivered in spades. 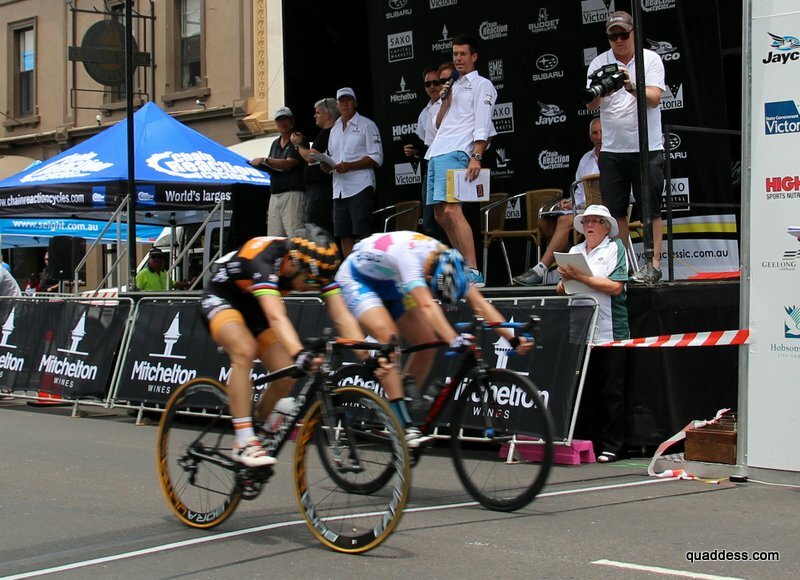 Thanks to SBS, we saw chicks on bikes live at Launceston’s Stan Seijka Cycling Classic in early December. Orica-AIS attacked repeatedly but the chequered flag went to 2013 national crit champion Kimberley Wells for Roxsolt, ahead of dual road race champion Gracie Elvin of Orica-AIS and British crit champ Eileen Roe of Wiggle Down Under. All national title holders. That little slice of coverage helped build knowledge and expectations for a rematch at St Kilda Cycling Club’s Shimano Supercrit two weeks later. This is one of the richer events around, with prize parity. It’s great to see WorldTour pros like Simon Gerrans, Mick Rogers, Greg Henderson and Koen de Kort live at the supercrit. It’s even rarer to see the elite women in action so a big crowd watched Wells sprint to another win, from Eileen Roe and Chloe Hosking of Hitec Products/Roxsolt. Would it be a Wells summer? 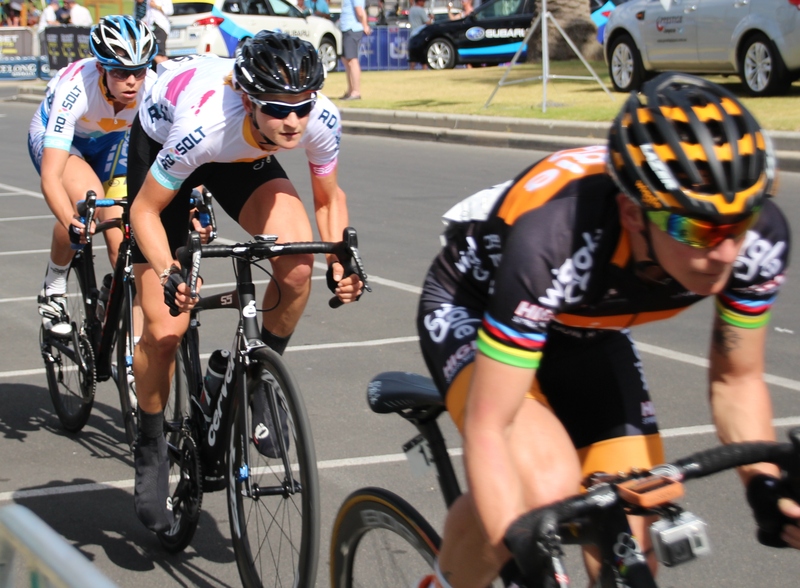 Roll around to the Mitchelton Bay Cycling Classic in early January – the bay crits that introduced equal prizemoney for women in 2013. Stage one on the Geelong foreshore was hot and the Euro pros suffered more than most, as Chloe Hosking took the win on debut for Wiggle from Lauren Kitchen for Roxsolt and Lizzie Williams for Orica. Stage two was brutal, with temperatures over 40C and wind gusts over 60 km/h. 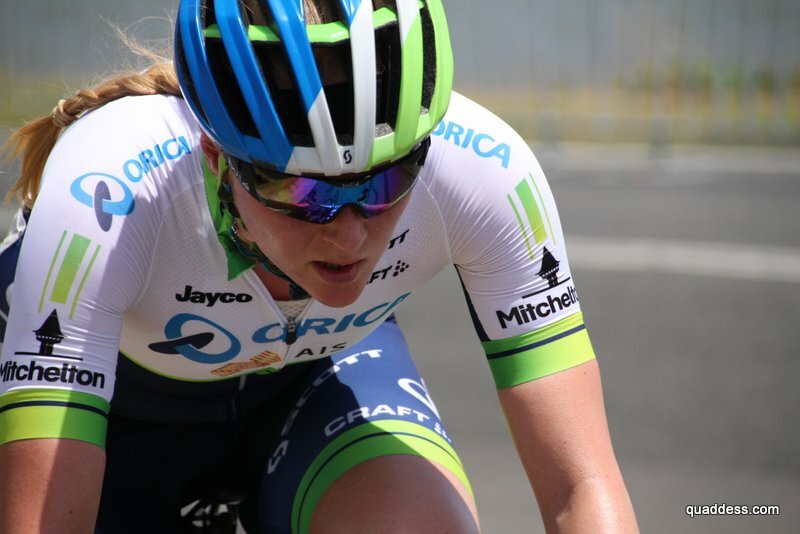 Orica’s Gracie Elvin broke away early, holding form and focus to the finish. It was an exceptional ride, buffeted by a furnace off the bay. Loes Gunnewijk (Orica) took second and Chloe Hosking third. Stage three at the hilly Portarlington circuit saw a popular win to Peta Mullens riding solo as she focuses on mountain bike for the year, from dual world road race champ Giorgia Bronzini of Wiggle and Lauren Kitchen. For the men, Orica neopro Caleb Ewan took his third stage win (but only just) from Steele von Hoff after Orica pulled back some brave breaks. So the elite women entered the fourth and final stage with just seven points separating first and fourth. By contrast, Ewan was unassailable. Wiggle had brought Italian Bronzini back to Australia to defend her 2014 series win, and in Williamstown with no margin for error she chased down everything that moved and survived a protest from Wells to win the stage while Hosking sealed the series. Lauren Kitchen and Orica’s Lizzie Williams rounded out the GC podium, but team leaders Bronzini and Elvin were tied just two points further back. The record books will show Wiggle won back-to-back series but they belie the competition. A determined break by an entertaining Greg Henderson and IAM Cycling’s Roger Kluge with Orica’s Michael Hepburn saved the men’s event from a clean sweep to Caleb Ewan. Wiggle team owner Rochelle Gilmore admitted later that the narrow points spread had her worried after three stages. “Coming in to today’s race we’d won one stage, and we could possibly have lost the series because the competition was so fierce. 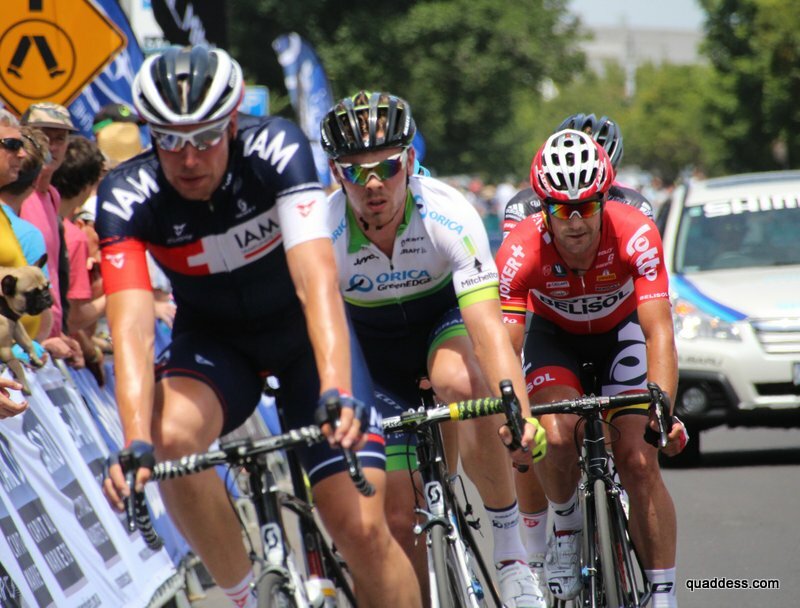 Orica-AIS and Roxsolt were so strong, so there were three teams in contention. Our girls had to work really really hard for it,” she said. At the business end of cycling it was a win to Wiggle too, in an event supported by the team sponsor’s online rival, Chain Reaction Cycles. Hosking was delighted with a win for her new team and confirmed the change in plan. “Gio [Bronzini] had just got off a plane from Italy and the temperatures were really hot for our Euros so they struggled a little bit with that. Bronzini said, “It was a really awesome race with attacks and they tried hard to go for a win. I like it when the teams go like that.” A handy tune-up for the Ladies Tour of Qatar. You had to feel for Scot Eileen Roe who clearly suffered on the hottest days, racing her first real Australian summer. “Rochelle told me to be prepared for bay crits to be hard: ‘These are probably the hardest crit races you’ll have ever done.’ And I’ve done quite a few crits in Holland which were quite hard [so] I initially thought that these would be OK.
Days later the Aussies rolled up again, this time in Ballarat for the national crit jersey. Wells outsprinted Peta Mullens for her second national crit title, with Lauren Kitchen third. Time trials were next, with Shara Gillow (Rabo-Liv Women’s Cycling Team) claiming a fourth title, ahead of Bridie O’Donnell (Total Rush Hyster) and Taryn Heather (Bicycle Superstore). With riders in such great form, expectations were high for the road race on the hilly Buninyong course. While Mullens won the green and gold jersey over Neylan, Shara Gillow pocketed the bronze and Tessa Fabry was an impressive fourth. Mullens had planned only one road race this year so the win made for great copy as well as a new contract with Gilmore’s Wiggle squad, even as she pursues her goals in the dirt. The men’s titles went to Richie Porte (time trial), Steele von Hoff (crit) and Heinrich Haussler (road race) – great results all round. Gilmore had headed to nationals still scouting a third Aussie for Wiggle (the maximum for the British-registered squad, the others being Nettie Edmondson and Chloe Hosking) even while planning the launch of her new NRS project, the High5 Dream Team. No wonder cycling struggles to find sponsors; Gilmore keeps signing them. Lots of the same faces are racing in Adelaide, with debut appearances by Subaru NSWIS NKC and High5. Sadly there’s been no scheduled coverage of the Santos Women’s Tour in Cycling Australia’s new broadcast deal with Nine but there’s highlights at the NRS website. Or get roadside for the last stage tonight in Adelaide. Or follow on twitter (#TDU women). Like roadnats. Switching on the tv today for the opening stage of Tour Down Under highlights the disparity in coverage. During the women’s opening stage, Gem was showing Blue Murder at St Trinians. Then there’s the disparity in prizemoney. Santos and the SA government wouldn’t consider paying women less, but others would argue it’s an NRS race rather than WorldTour event (and 17 years old). The women’s race can only get bigger and better. The women have delivered the product. They’re tough, media-friendly and seem to have a good time – a sponsor’s dream. There’s much to do but 2015 is looking good. This entry was posted in Cycling, Racing, Women's cycling and tagged #MelbourneCycling, #TDUwomen, women's cycling, women's racing by quaddess. Bookmark the permalink.